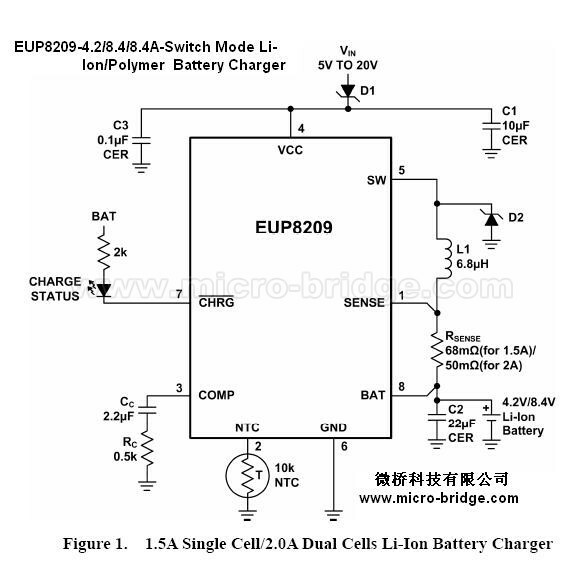 The EUP8209 is a constant current, constant voltage Li-Ion battery charger controller that uses a current mode PWM step-down (buck) switching architecture. 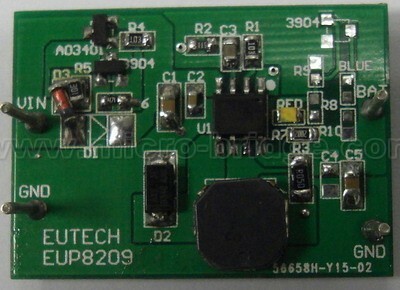 With a 500kHz switching frequency, the EUP8209 provides a small, simple and efficient solution to fast charge one (4.2V) or two (8.4V) cell lithium-ion batteries. The EUP8209 charges the battery in three phases:conditioning, constant current, and constant voltage. Anexternal sense resistor sets the charge current with ±10% accuracy. An internal resistor divider and precision reference set the final float voltage to 4.2V per cell with ± 1% accuracy. An internal comparator detects the near end-of-charge condition while an internal timer sets the total charge time and terminates the charge cycle. The EUP8209 automatically re-starts the charge if the battery voltage falls below an internal threshold, 4.05V per cell. The EUP8209 also automatically enters sleep mode when DC supplies are removed.The EUP8209 is available in the 8-lead SOP package.